To be frank, I’m not a huge fan of this type of music for the most part. With a handful of exceptions, a lot of the groups that I call “radio friendly hard rock” from the last decade tend to be too same-sounding for my tastes. Since I’m not a fan, I was unfamiliar with the band Dark New Day. I’m a huge fan of Sevendust however, and was intrigued to learn more. 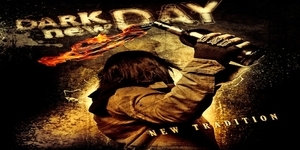 Dark New Day’s New Tradition is the much anticipated follow up to their 2005 debut Twelve Year Silence. Compromised of members of Sevendust, Evanescence, and Stereomud, among others, it’s pretty much going to likely follow the same basic structure of this style. One thing that caught my ear immediately was the fact that singer Brett Hastla of Virgos Merlot actually has the ability to sing instead of being the same cookie cutter sound of Eddie Vedder and Scott Stapp so prevalent in bands these days. Beyond that there’s no new ground explored here. There’s nothing necessarily wrong with that. Fans of bands like Three Days Grace and Breaking Benjamin will likely find this to be an incredible album. Trying to put myself in the frame of mind of someone that is a fan, the songs are pretty strong, with lots of grooves. I did find the tracks that were a little more reminiscent of Sevendust like “Come Alive,” “Tremendous,” and “Straight Jacket” to a lesser degree to get me sucked in, but then it veered into territory that just doesn’t fit my particular likes. The musicianship, despite my musical misgivings, is super tight and has cohesion of a full time band as opposed to a “side project.” Other than the aforementioned tracks, there were moments I was nearly drawn in, but there were more times I found I’d rather listen to something else. Again, not a knock against the actual songs featured, it’s simply not a style I listen to with any frequency. If you enjoyed Dark New Day’s debut, then you can’t go wrong picking this one up as well. It’s a testament to the abilities of the musicians and songwriters featured on this record that even a non-fan would still suggest an album for people to check out. I don’t like doing negative reviews, and always try to find positives in music, movies, and what have you. Every band has at least a fan or two, and if I feel like it fits something someone would enjoy no matter my personal opinion then I will say it. It always made me angry in the past to read a review of a band or album I really enjoyed get ripped apart by someone who wasn’t a fan and didn’t get what the band was trying to do. This has to be one of those releases that has to grow on you before you accept it as something new that sounds good, it feels like a weird mix of an eclectic idea thrown in together with other abstract leads to create what we have here in “Crime Scene”.